The Pet Food Drive will benefit Long Island Cares - The Harry Chapin Food Bank. Suffolk County Legislator Robert Trotta with his dog, Buddy. Smithtown, NY - February 19, 2015 - Suffolk County Legislator Robert Trotta announces that he is participating in Long Island Cares’ fourth annual Legislative Food Drive Challenge to focus on providing pet food for its clients. Since 2009, Long Island Cares has provided free pet food and supplies to individuals and families in need, in an effort to help them maintain their pets at home instead of placing them in shelters. Legislator Trotta pointed out that, according to Long Island Cares, dog and cat food is one of the most requested items by their member agencies because of the costs of heating a home, buying medications, paying bills and putting food on the table. “Pets keep many people going, giving them comfort and a reason to survive in difficult times so I appeal to the good neighbors and pet lovers of my district to help out,” said Legislator Trotta. Pet products that are being collected at Legislator Robert Trotta’s office at 59 Landing Avenue in Smithtown are canned and dry cat/dog food, cat/ dog treats, bird seed, fish food, kitty litter and small new toys. Legislator Trotta will be holding the drive from now until April 30, and his office is open Monday – Friday from 9am until 5pm. For more information, please call Legislator Trotta’s office at 854-3900. 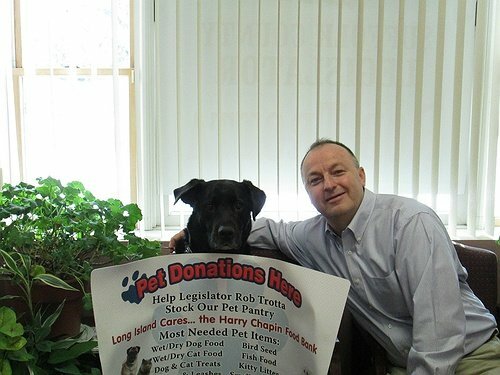 Subject: LongIsland.com - Your Name sent you Article details of "Suffolk County Legislator Robert Trotta Holds Pet Food Drive"